Go Duke! The motto of the Duke Football team and the other Duke University Athletics teams. Who hasn't heard of the Duke Bluedevils or spelled correctly, the Duke Blue Devils? One of the most recent headlines was: Duke 2010 NCAA Basketball National Champions . But here we are talking about Duke Blue Devil Football. It is another awesome college football team in the ACC and represents one major part of the Duke Sports program. They are a member of the NCAA's Division I - the Atlantic Division of the Atlantic Coast Conference and play according to this Duke Football Schedule. The history of the Duke Blue Devils started back in 1895. The most famous Duke football season happened in 1938, when Wallace Wade was head coach and the "Iron Dukes" were born. Everyone in the college football world was shocked when Wallace left Alabama for Duke in 1930. He later rationalized the move by saying that Duke shared his belief that "a school should provide its athletes with a strong academic background". They have won seven ACC Football Championships, which is the fourth most in the ACC trailing only Clemson, Florida State, and Maryland. Ten ACC Football Players of the Year have come from Duke, the most in the ACC. Additionally, three 3 Pro Football Hall of Famers have come through Duke's program, tying the Miami Hurricanes for the most in the ACC. Duke has a great track record and is - academically - consistently ranked at or near the top of the list of Division I-A schools which graduate nearly all of their football players. Duke has topped the list 12 years, earning it the most Academic Achievement Awards of any university. Notre Dame has been honored six times, while Boston College and Northwestern have won the award four times each. The Rose Bowl twice in 1938 and 1941. The Sugar Bowl in 1944. The Orange Bowl twice in 1954 and 1957. The Cotton Bowl in 1960. The All American Bowl in 1989. And in more recent years the Hall of Fame Bowl in 1994. However, they are still waiting for their first college bowl game win in the 21st Century. 10 ACC Football Players of the Year have come from Duke, the most in the ACC. Additionally, three 3 Pro Football Hall of Famers have come through Duke's program, tying the Miami Hurricanes for the most in the ACC. 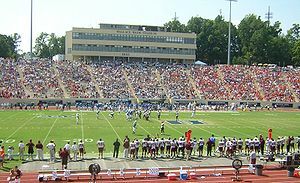 The Duke Blue Devils home games are played at Wallace Wade Stadium. The stadium, opened in 1929, is located on the campus of Duke University in Durham, North Carolina. The horseshoe-shaped stands are elevated six feet above the track. Seating for the stadium is for 33,941 people. Originally named Duke Stadium, it was renamed in 1967 for the legendary Duke football coach, Wallace Wade. 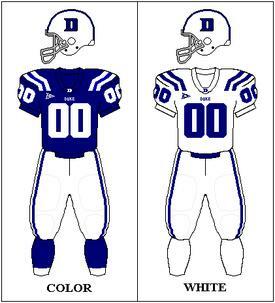 The current Blue Devils Uniform colors are blue and white. Their mascot is the blue devil and their fight song is known as "Fight! Blue Devils, Fight! ", "Blue and White"